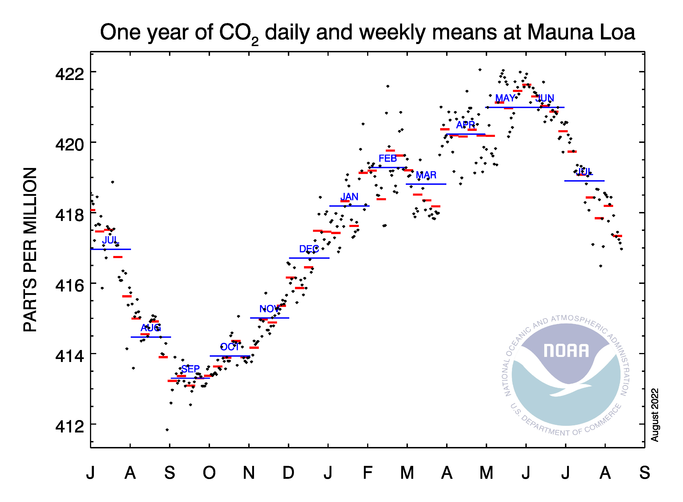 CO2 ppmv definitely off the nadir plateau and making its winter power climb now. thanks T looks like plus 2ppm for October ? kiwichick wrote: thanks T looks like plus 2ppm for October ? Close to 2.5 on the graph, the short lines are half a ppmv each. Looking at that graph we will be permanently over 410 ppm by 2020! We really are rushing to the phase change in climate aren't we? Yes, we can all say, 'Well, duh!" having been regularly updated by T on these numbers. Its just the week to week variability, the annual average is quite bad enough with getting out of sorts over a meaningless extreme. Good point. What has been the long-term trend in annual increase numbers, by the way. I haven't been following as closely as I should. Any graphs you have on hand would be most welcome. Thanks. dohboi wrote: Good point. What has been the long-term trend in annual increase numbers, by the way. I haven't been following as closely as I should. Any graphs you have on hand would be most welcome. Thanks. The ten year moving average is up to 2.11 ppmv annually. You really could just post this graph once a year. Daily numbers are reasonably useless. Thanks, diemos. I am very familiar with that graph, of course. I was looking for a graph of the rate of increase, rather than just of the cumulative numbers. What we want to see is signs that the rate of increase is leveling off, at least, which might give hope that the rate of increase would start to decline, and finally the increase itself would reverse. But we are pretty clearly a long way from that, as far as I can see.